Kicking off our Angkor visit. With three days to spend exploring the ruins, we decided to save the best for last and start with some of the lesser-known sights. Although this is called the “Grand Tour,” don’t let the name fool you – it’s simply named after the size of the loop that you make and not the importance of the sights that you see. 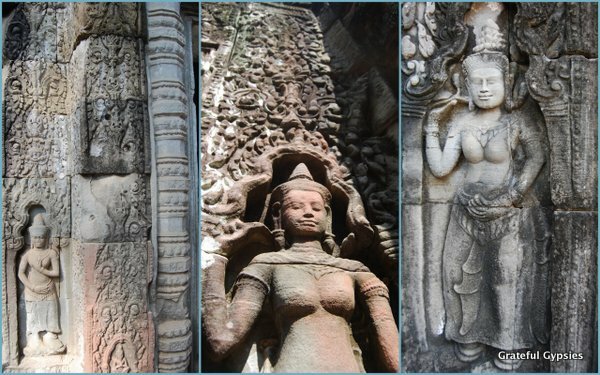 If you only have one day to explore Angkor, you most likely won’t be doing the Grand Tour. We hired a tuk-tuk driver for the day from our hostel for about $15 since you need to cover a lot of ground to make this loop. The first stop was Preah Khan (Holy Sword), a large and impressive temple. We had a bit of fun with Pooperman by setting him up in random places and watching Chinese tourists snap photos with him. 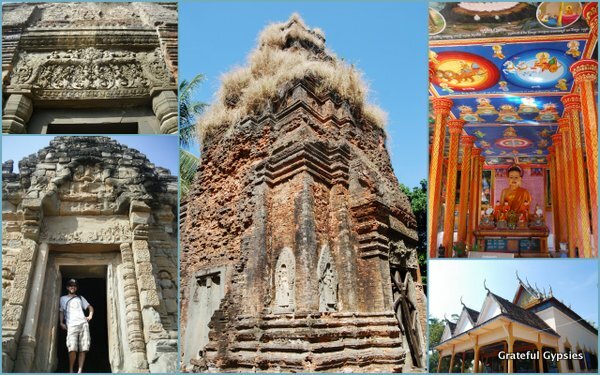 Some of the temples on the Grand Tour. 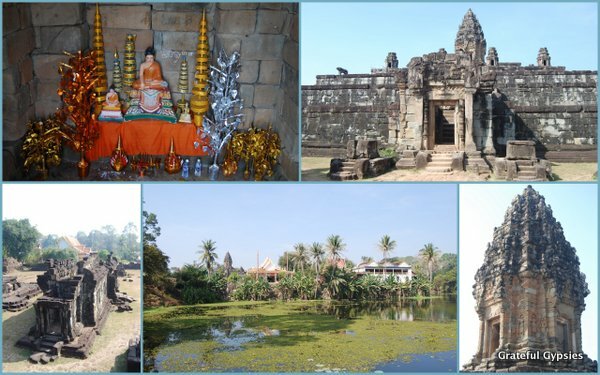 Our visit continued with a short stop at Neak Pean (The Entwined Serpents), an artificial island with a Buddhist temple. While the boardwalk that gets you there is nice, you can’t get very close to the temple at all. 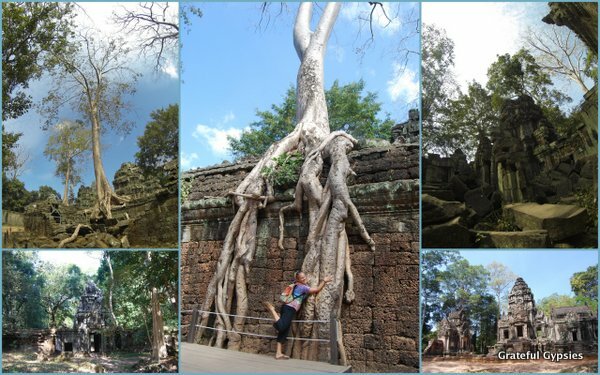 More interesting was our next stop at Ta Som, a largely unrestored temple where plenty of trees have taken over. A tasty lunch near the lake. With bellies rumbling, it was time to take a lunch break. Our driver took us to a nice restaurant looking out over a small lake. 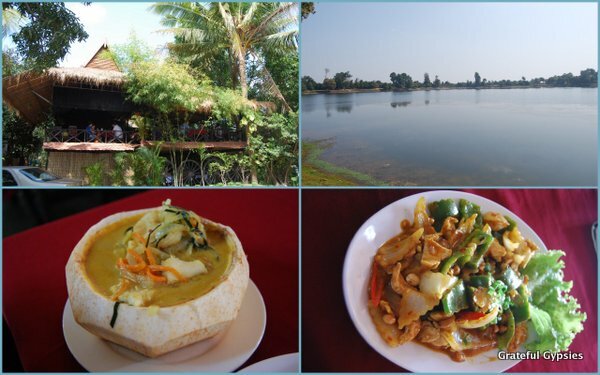 We feasted on the Cambodian specialty fish amok (this one came in a coconut), and some yummy chicken curry. East Mebon temple on the Grand Tour. After lunch, we hit a few more temples – East Mebon, Pre Rup, and a couple of others whose names are escaping me. At some point in the day, you definitely start getting a bit of temple fatigue. The intense Cambodian sun doesn’t help, either. Having learned a lot about the temples the previous day at the museum, we decided to visit on our own. Obviously, there are advantages and disadvantages of going with a group or a private guide. If you really want to get all the history behind each temple, investing in a guide or at least a good guidebook is probably worth it. We just prefer to read the placards to get a brief introduction and then wander around at our own pace, simply taking in the sights and sounds. A great first day exploring Angkor. Our first day was a big success – we saw quite a few temples, didn’t wear ourselves out, and had lots of fun thanks to silly photo shoots with our stuffed superhero. 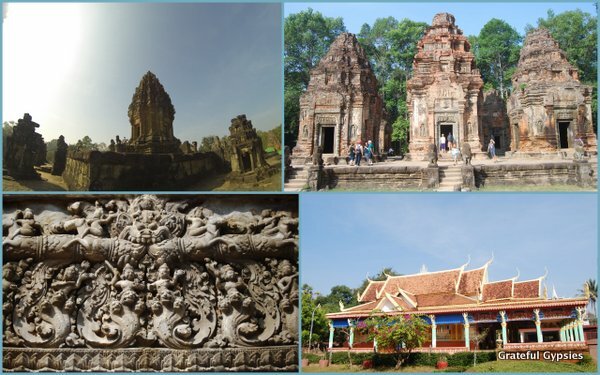 Some scenes of the Preah Ko temple. We kept our driver for day two and decided to see the small cluster of temples known as the Roluos Group. As these temples are quite far from the others, much fewer tourists make it to them. This area was once a great capital city called Hariharlaya. 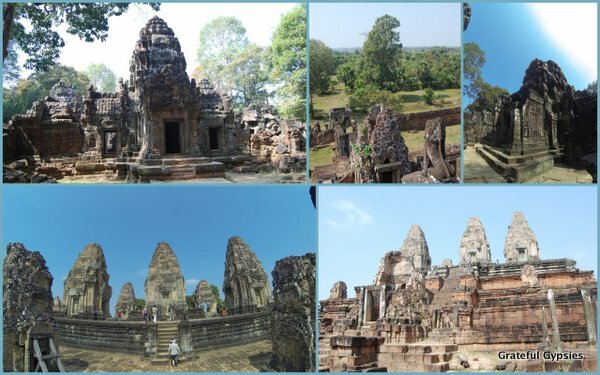 Dating from the 9th century, these are some of the earliest Khmer structures. First up, we visited Preah Ko (Sacred Bull) – the oldest of the three main temples here. Next up we hit Bakong, the first temple mountain of sandstone built by the Khmer empire. This temple bears a striking resemblance to Borobudur in Indonesia, leading many to believe that ideas were exchanged between the two great civilizations. Lolei temple and the monastery attached to it. Braving the crowds for sunset. As the Roluos Group only takes a few hours, we had the rest of the afternoon to visit a floating village. 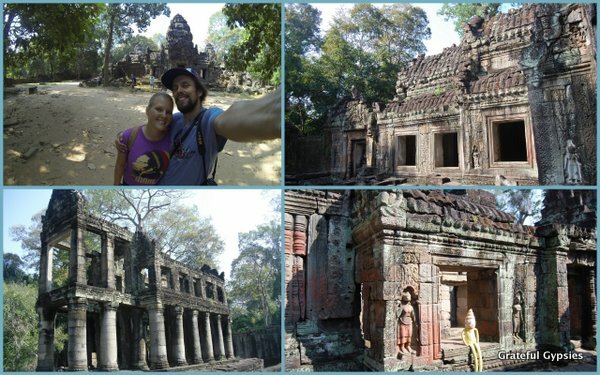 You can read about that and the other things we did in Siem Reap in our last post. 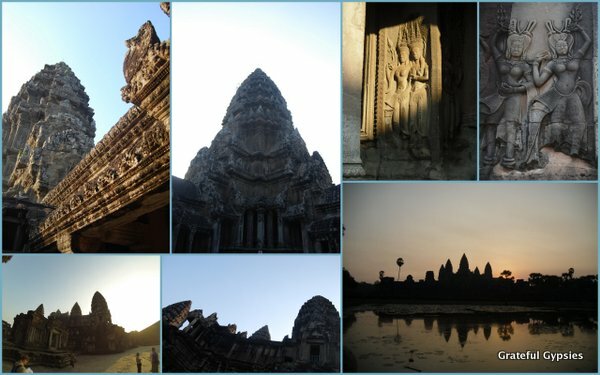 In the evening, our driver took us to the temple of Bakheng – a popular place for sunset. While the views were nice and all, the crowd was almost too much to bear. 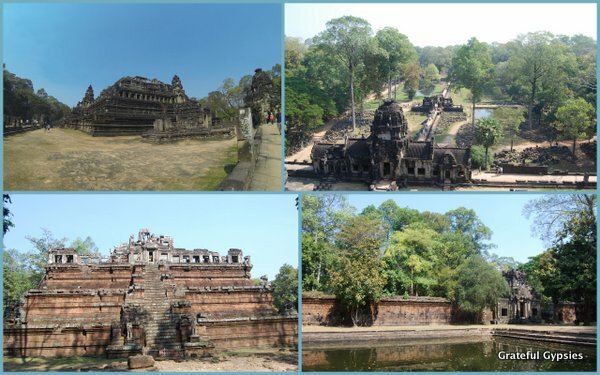 Due to its popularity, Bakheng is one of the most threatened temples of Angkor. There are other, much less crowded places to watch sunset, so seeking one of those out may be a more enjoyable experience. My best photo of sunrise. Not great but it’ll do. Again, don’t let the name deceive you – there is nothing mini about this tour. This is the granddaddy of ’em all, the main event, the reason why millions of tourists flock here every year. Having spent the previous day lounging by the pool, we were full of energy and ready for something epic. Being the crazy person that I am, I proposed seeing the Smile of Angkor show, hitting the pub street, staying up all night, and cycling to Angkor Wat in time for sunrise. While Rachel couldn’t help but catch a few hours of sleep, my excitement managed to keep me going. In the pitch black of the early morning, we peddled our rented bikes for nearly an hour before we reached Angkor Wat. Although it was an ungodly hour in the morning, hundreds of photographers had staked out their spot with giant tripods. 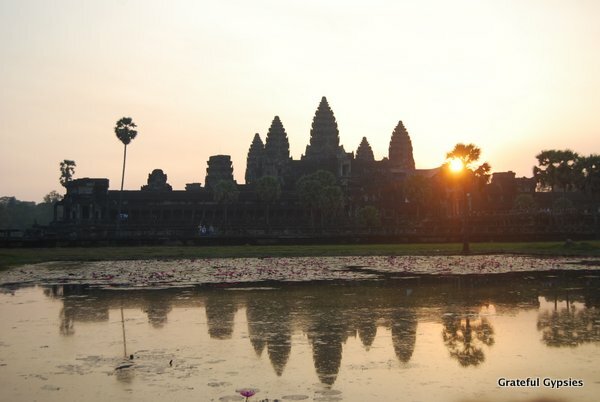 A sunrise photo at Angkor Wat is the “I <3 NY” t-shirt equivalent of Siem Reap – every tourist has to have one. You can read all the guidebooks you want, but nothing will prepare you for the sheer magnificence that is Angkor Wat (City Temple). Khmer King Suryavarman II had this originally Hindu temple built in the early 12th century to serve as his state temple and eventual mausoleum. Breaking from tradition, it was dedicated to the Hindu god Vishnu. This temple has become the symbol of Cambodia, and it is the only man made object to appear on a country’s flag. It’s also the largest religious monument in the world. Although the crowd was a bit obnoxious for sunrise, as soon as that was over people really spread out. As they only allow a certain number of people up on the top of the temple at one time, it’s never too crowded. We had an amazing couple of hours exploring all corners of Angkor Wat, admiring the intricate carvings and the sheer beauty of it all. I’m not a religious person, but visiting this sacred temple was quite a spiritual experience. 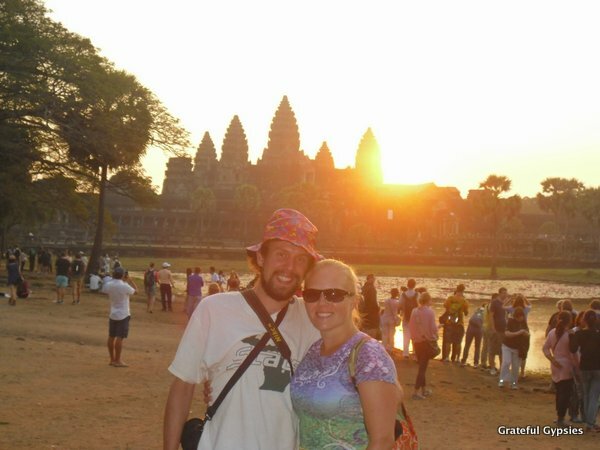 While we had a lot of highlights during out 7.5 month trip around SE Asia, catching sunrise at Angkor Wat was easily the most memorable. 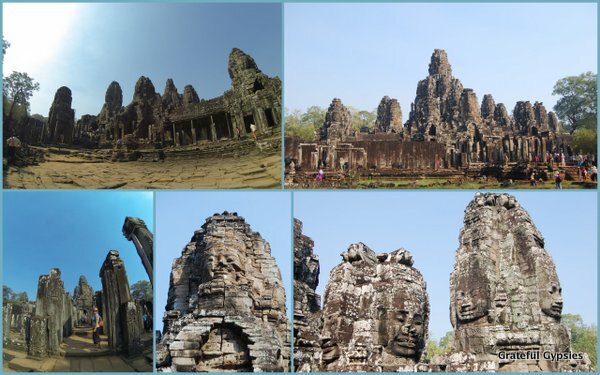 The many faces of Bayon. As we were heading out of Angkor Wat, the buses full of Chinese and Korean tour groups started filing in. One good thing about getting up for sunrise is that most people aren’t willing to; the crowds are much larger in the morning once the tour groups have finished breakfast. 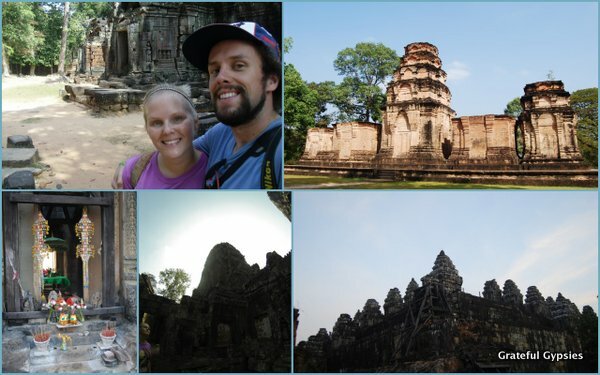 We cycled over to Angkor Thom (Great City), the last and most enduring Khmer capital. King Jayavarman VII established this as the center of his empire, where he had the spectacular Bayan built as his state temple. Often referred to by wide-eyed backpackers as “the face temple,” Bayon features dozens of towers with serene stone faces. This represents a more baroque style of Khmer architecture, as opposed to Angkor Wat’s classical style. Although it really is incredible taking in the magic of this temple, the hordes of selfie-snapping tourists were too much to bear. Learn from our mistake and get some food, have a coffee, or just find a spot to relax for the hours of 10-noon. Wait for the tour groups to head off on their per-arranged lunch break, and then head to Bayon to have it nearly to yourself. More temples of Angkor Thom. There’s much more to see in the ancient walled city, so we pedaled our bikes around and stopped at a few other temples. Perhaps the highlight of our day came when we rode pretty far down a dirt road and ended up at a little shack where a family sells drinks and fresh fruit. Munching on fresh, juicy mango and pineapple, we watched the children play with cats, dogs, and even monkeys while monks were coming in and out of a temple. 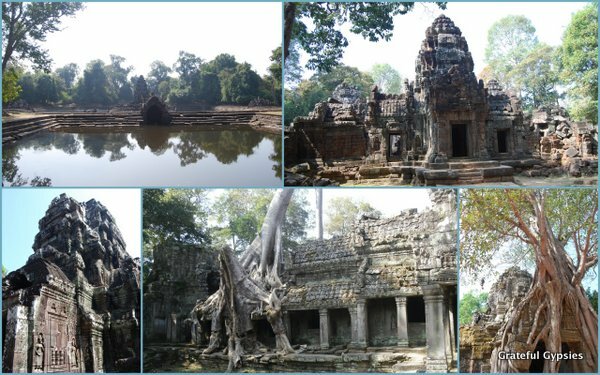 This reminded us that many people still live within the Angkor park, going about their lives much in the same way as people did a thousand years ago. With another day to explore, we definitely would have spent the extra time visiting the tiny, remote temples where tourists are nonexistent. Our final stop of the journey was Ta Prohm – one of the most famous temples of Angkor due to its appearance in the Hollywood movie “Tomb Raider.” Built as a Buddhist monastery and university, Ta Prohm has been left in much the same condition in which it was found. Trees growing out of the temple make for quite the sight, as well as a great photo-opp for a couple of tree-hugging hippies. Exhausted and covered in dirt, we began the long haul back to town. Stopping in a local supermarket to cool off and get some celebratory drinks, we were incredibly surprised to find two of our favorite American beers – Sierra Nevada Pale Ale and Fat Tire – sitting in the cooler. It was the perfect end to what had been a life-changing three days exploring the temples of Angkor. We can’t recommend getting the 3-day pass enough, and we even think getting the 7-day pass would be better. If you’re planning your SE Asia adventure, don’t sell this place short and only visit it for one day. We made it to sunrise! Transportation: We hired a driver for two days at $15 per day and gave him a tip at the end. For the third day we rented bicycles for $2 each from our hostel. 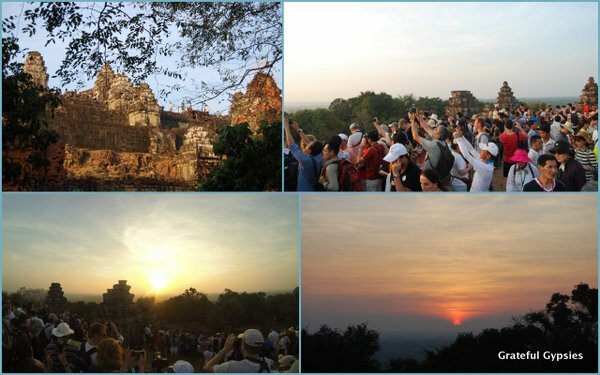 Definitely do sunrise at Angkor Wat. It’s cliched and busy for a reason. As for sunset, find a more peaceful and quiet spot than the popular Bakheng. Avoid the big temples (Bayon, Ta Prhom) during the peak hours (9-12 and 2-5). Visiting earlier or later when the groups are eating will be a much better experience. Bring plenty of water and some snacks, as everything is much more expensive in the park. Cycle down small roads to hang with locals and see monks going about their day. Save the Mini Tour for your last day. If you see Angkor Wat and Bayon first, everything else is going to be disappointing.